Why Purchase a Home Warranty? Survey: What Life Goals Are Millennials Postponing? “Tomorrow” is a phrase commonly uttered by just about everyone. Laundry, yardwork, or homework; all of it can wait until tomorrow. But when it comes to Millennials, who were the basis of our study, more things are put off than menial chores. It can be tough to save money or complete an education, as life does get in the way of these things sometimes. And the trials for Millennials have been particularly difficult, as many found themselves graduating college while the country was mired in a recession. So important things such as setting up a 401k or homeownership get set aside in favor of shorter term needs, like affording rent or food. Since Millennials are characteristically delaying what is considered by older generations life “goals,” we sought out to ask them which they were most likely to postpone: having children, homeownership, investing in a 401k, finishing their degree or getting married. Note: The Millennial Age Range is a tad ambiguous, but generally refers to those born in 1982 to 1997, depending on which source you use. Obviously those who are 33 years old will have different life goals than those who are 18 years old, so we compared the 18 – 24 year, and the 25 – 34 year age range to see if there were big differences. 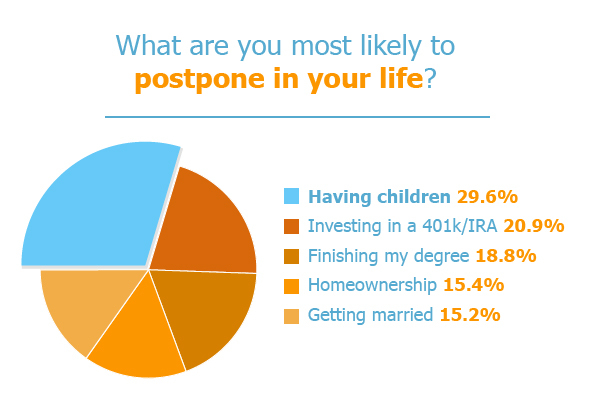 The most commonly delayed life milestone was having children, with almost 30% of respondents. Studies correspond with these responses as well, as they have shown that women are waiting much longer to have children. In 1970, the average age of a first-time mother in the U.S. was 21; as of 2013, it is 26. Investing in a 401k was the next most likely to be put off at nearly 21%, and finishing a degree garnered nearly 19% of responses. Perhaps unsurprisingly, a far higher percentage of men (32.6%) compared to women (26.8%) responded that they were likely to put off having children. We were quite surprised to find that those making between $100,000-149,000 responded they were most likely to put off setting up a 401k, at a 33% rate. In direct relation to this, those in the 25 – 34 age bracket responded they were most likely to put this off at a higher rate than the 18 – 24 age bracket. Both results went against what common sense tells us, in that those who are older and/or making more money should be more able to contribute to a 401k. However, one study says that 45% of working age households have no retirement assets of any kind. This could be attributable to many things; an increase in wanderlust among those 34 and younger, low salary (those making less than $25,000 responded they were most likely to put this off at a 28.7% rate), or living expenses causing an inability to save properly. As previously noted, men are far more likely to postpone having a child than women. But what about the rest of the options? At 22.4% and 14.9% respectively, women were far more likely to put off finishing their degree than men. This is interesting to note, as a recent study shows that women aged 25 – 34 are more likely than men to have graduated college. Perhaps the responses to this option in our survey were from those not currently enrolled in school, as it appears that women actually enrolled finish at a 21% higher rate than men, again according to the study. The Choice Home Warranty survey asked respondents aged 18 – 34 “What are you most likely to postpone in your life?” using the Google Consumer Surveys tool. The survey ran in July 2015 and gathered 1,034 responses. Results are weighted by inferred gender and region to reflect the population. Sign up today and get your first month FREE* ! Is a Mobile Home Warranty Right for You? Air Conditioner Insurance vs. a Home Warranty: What’s the Right Choice? What Is a Home Protection Warranty and What Does it Cover? 1090 King Georges Post Rd. © 2018 Choice Home Warranty. All rights reserved. Choice Home Warranties are not available in California. *With purchase of single payment plan.